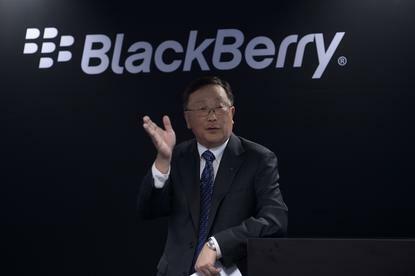 BlackBerry surprised Wall Street by getting its bottom line back into the black in the fourth quarter, but sales shrunk significantly again, putting in question CEO John Chen's assertion that the company's turnaround is on track. BlackBerry is trying to become less dependent on hardware, counting instead on software such as the BES12 enterprise mobile management platform, which can be used to manage not only the company's devices but also iOS, Android and Windows Phone smartphones. During the quarter, which ended Feb. 28, software revenue grew 24 percent on a sequential basis and 20 percent year-on-year to US$67 million, the company said Friday morning before the U.S. financial markets opened. However, that's still only 10 percent of BlackBerry's overall revenue, which dropped by about 32 percent year-on-year to just $660 million. So even if software revenue is growing, it isn't growing nearly fast enough to make up for drops in hardware and services revenue. Analysts polled by Thomson Financial had a consensus expectation for revenue of $786.4 million. For example, only 1.6 million [m] BlackBerry smartphones were sold through to end customers during the quarter, down from 3.4 million smartphones a year ago. This despite the fact that the overall smartphone market is still growing at a healthy rate. However, Chen isn't ready to give up on hardware. At Mobile World Congress, the company launched the BlackBerry Leap smartphone and at the Cebit trade show in Germany it announced an Android tablet with special security features. The company still managed to report net income of $28 million, or $0.05 per share. On pro forma basis, earnings per share came in at $0.04, beating the consensus estimate for a loss of $0.05 per share. During the past year the company has been working on getting its financial house in order while creating a multi-year growth strategy and investing in its product portfolio, BlackBerry said in a statement. The aim is now to stabilize revenue and achieve sustainable profits, it said. "We now have a very good handle on our margins, and our product roadmaps have been well received," Chen said. BlackBerry shares were up about 3.6 percent on the Nasdaq exchange shortly after trading began.